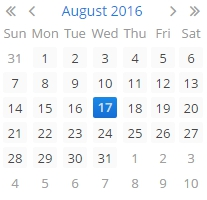 DatePicker is a field to display and choose a date. It has the same view as the drop-down calendar in DateField. XML name of the component: datePicker. 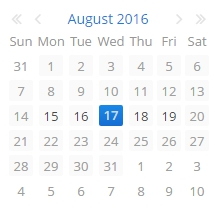 The DatePicker component is implemented for Web Client. In the example above, the screen has the orderDc data container for the Order entity, which has the date property. The reference to the data container is specified in the dataContainer attribute of the datePicker component; the name of the entity attribute which value should be displayed in the field is specified in the property attribute. You can specify available dates to select by using rangeStart and rangeEnd attributes. If you set them, all the dates that are outside the range will be disabled. Date accuracy can be defined using a resolution attribute. An attribute value should match the DatePicker.Resolution enumeration − DAY, MONTH, YEAR. Default resolution is DAY. Today’s date in the calendar is determined against current timestamp in a user’s web browser, which depends on the OS time zone settings. User’s time zone doesn’t affect this behaviour.